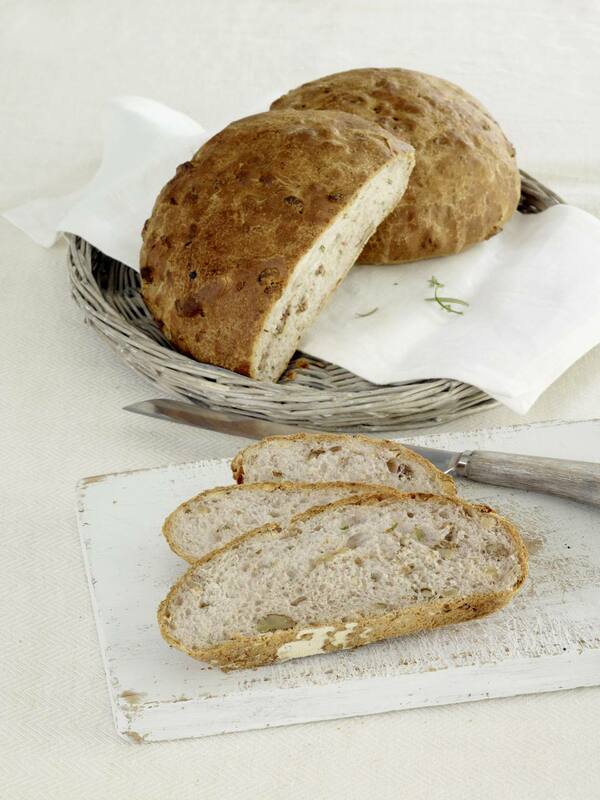 This recipe for Gluten-Free Walnut Rosemary Bread makes a savory, crusty and aromatic loaf of walnut-studded, rosemary-flecked bread. The loaf is baked in a pre-heated enamel Dutch oven or lidded ceramic bowl. The results are a beautifully crusted, fragrant loaf of gluten-free bread, perfect for sandwiches or toast. For a lovely basic gluten-free bread with crusty flavor, omit the rosemary and walnuts, and you will get a moist, everyday gluten-free sandwich bread. Place dry ingredients in a large mixing bowl and whisk until well blended. In a separate bowl, lightly beat eggs with a fork. Add vinegar, olive oil, honey and 1 cup water and stir to blend. Mix at low speed, slowly adding liquid to dry ingredients. Beat on medium speed for 2 minutes. If the dough is too stiff add water, a little at a time, until a thick, shaggy dough forms. Add walnuts and rosemary and mix just until evenly distributed. Scrape down sides of the bowl with spatula and cover bowl with a tea towel. Allow to rest for 30 minutes. Preheat oven to 400 degrees. Pour 3 tablespoons of olive oil in a 2-quart enameled Dutch oven or ceramic ovenproof casserole dish with a lid. Place the pan or bowl, without the lid on, in the oven and allow to preheat while the bread dough is resting. Carefully scrape the bread dough into the hot pan. Dip a spatula in water and use to smooth the top of the dough. Brush 2 tablespoons of olive oil evenly over the top. Cover with lid and bake for 35 to 45 minutes, or until an instant thermometer, inserted into the middle of the bread reads 205 degrees. Remove bread from pan and let cool before cutting. If the dough seems too thick, add more warm water, 1/3 cup at a time until dough is the consistency of thick biscuit dough. Gluten-free flours absorb water differently- if you substitute other Gf flours in this recipe, you may need to adjust the amount of water used. Gluten-free bread doesn't keep well. Eat this bread fresh out of the oven, or allow to cool completely and freeze. To reheat- wrap bread in parchment paper and warm in a 300 F oven for 15-20 minutes. Serve bread with a garlic or balsamic vinaigrette dressing dipping sauce, or just a bowl of fruity, extra virgin olive oil.